The Association of Indigenous Village Leaders (Vereniging van Inheemse Dorpshoofden in Suriname – “VIDS”) is an association of indigenous village leaders from every indigenous village in Suriname. 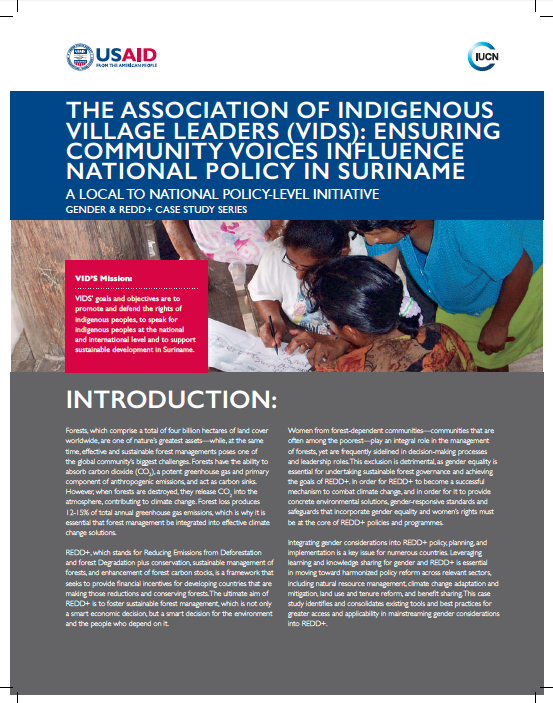 VIDS was established by village leaders in 1992 and its goals and objectives are to promote and defend the rights of indigenous peoples, to speak for indigenous peoples at the national and international levels, and to support sustainable development in Suriname. VIDS has taken a leading role in promoting indigenous rights, sustainable development and environmental protection in Suriname. It believes that all three are interrelated and must be supported and monitored. In VIDS’ Multi-Annual Strategic Programmes, indigenous women’s rights have been included in most aspects of the objectives and strategies, and also focuses on indigenous women’s inclusion in decision making, particularly related to strengthening their rights, participation in national policy- and decision-making, and bolstering their socio-economic position. Women in indigenous communities also participated in trainings and workshops on human rights, indigenous peoples’ rights, women’s rights and micro-enterprise development. They learned to implement community-based and market research, depending on which economic activities they were interested in pursuing and participating in, such as processing food products from raw agricultural harvests and crafts.